Let us know which version you tested on which operating system. If you find an issue, please search Github for known issues first and then open a new Github issue. See Release Notes for a list of changes, and testing reports for earlier releases (v0.17.1), for an idea what to test. @kiv06041992 mind sharing relevant configuration? bitcoind v0.18.0rc1 is using 100% CPU resources while syncing the blocks. Top, the processes monitoring utility, shows bitcoind-opencon thread is the CPU hog. Ran with -proxy=127.0.0.1:9050. I can try reproduce an issue on Ubuntu with Russian language. Which desktop environment do you use? Let us know your bitcoin.conf and your command-line options if any as well. On the other hand, you can submit a new issue. tested language of en, zh_CN and zh. it shows Chinese successfully with zh_CN setting, but shows english with zh setting, which also means Chinese. I looked debug.log and saw it. After this message bitcoin core crashed. @kiv06041992 Could you please share the lines before that in the debug.log? @kiv06041992 looks like your exception is the same as https://stackoverflow.com/a/23135989. Mind sharing boost version used to build? Does this also happen if you run bitcoind? If so, could you please run bitcoind in gdb to get a stack trace of the exception? I did not use build. Please run bitcoin-qt -nowallet and see if the error occurs. @MarcoFalke the fix does this? My node is still working. Thanks. @kiv06041992 note that running with -nowallet doesn't fix the issue. Idem for compiling v0.18.0rc1 tagged branch from source. - Add creating a pinned meta-issue dedicated to testing the release candidate and communicating it in release announcements where useful. The former is done in practice (e.g. bitcoin#15555, bitcoin#14902) and the latter addresses the discussion here: https://x0f.org/web/statuses/101753569204220416. 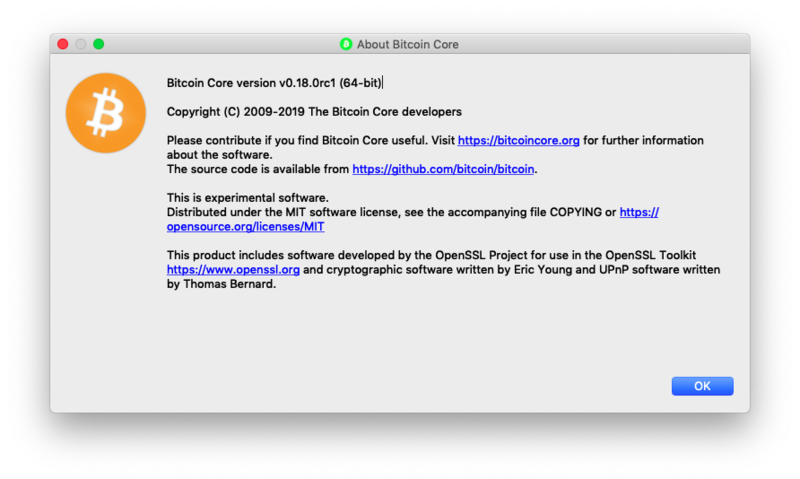 - Add creating a Release Notes draft wiki for collaborative editing at https://github.com/bitcoin-core/bitcoin-devwiki/wiki as seen for v0.17.0 and the current v0.18.0 release. I'd advise against reporting issues here. They should go in their own report. Otherwise it is hard to follow-up on reports when everything is in the same thread. - Create a pinned meta-issue dedicated to testing the release candidate and communicate it in release announcements where useful. The former is done in practice (e.g. bitcoin#15555, bitcoin#14902) and the latter addresses the discussion here: https://x0f.org/web/statuses/101753569204220416. - Create a Release Notes draft wiki for collaborative editing at https://github.com/bitcoin-core/bitcoin-devwiki/wiki as seen for v0.17.0 and the current v0.18.0 release. - As per http://www.erisian.com.au/bitcoin-core-dev/log-2019-03-28.html#l-342, for the period during which the notes are being edited on the wiki, the version on the branch should be wiped and replaced with a link to the wiki which should be used for all announcements until final. - Before final, remove the "Needs release note" label from relevant PRs/issues and merge the release notes from the wiki into the branch. - Steal/adapt/merge the updates in bitcoin#15692. Hmm, looks like you are missing the debug symbols. You might want to try to download them into the same folder where your bitcoin-qt is located and then start gdb again (it should then print something like Reading symbols from ./bin/bitcoin-qt...Reading symbols from ./bin/bitcoin-qt.dbg...done. Thread 1 "bitcoin-qt" received signal SIGINT, Interrupt. 39      ../sysdeps/unix/sysv/linux/ppoll.c: No such file or directory. Hence maybe a prune=550 issue. @farrilis but what happens without prune in 0.18? without prune I don't see this issue using 0.18. My full NETWORK_NODE is in a different VM. In 0.18.0rc3, the new getrpcinfo returns JSON with a key "duration", but there is nothing in that key name or in bitcoin-cli help getrpcinfo that tells me what time units it's counting in. Is that duration in seconds? Milliseconds? I have no idea. @bitcoinhodler it is microseconds. getrpcinfo help message was completed in #15754. Second argument must be numeric (maxfeerate) and no longer supports a boolean. To allow a transaction with high fees, set maxfeerate to 0. In skimming the draft release notes I could not find anything mentioning this change, is it worth adding? The change affects all prior versions of lnd including 0.6 tagged today, so we'll be working on an update to our rpcclient to support the new numeric value and support downgrading to the boolean value on pre-0.18 nodes in our next 0.6.1 release. @cfromknecht #13541 isn't part of v0.18, (it's currently in master and will be released in v0.19), so I'd assume that user is running some version of master they've compiled themselves. Although looking at the related issue, they originally said they were running v0.17.1, so it's a bit hard to tell? @Sjors Hi, thank you for this thread. I'm also trying to test 0.18.0rc4. I have a question if anyone knows what the button Main Window on bitcoin-qt is for? I am running v0.18.0rc4, started seeing this button since last RC version, could not get it to do anything, thought it would be fixed in RC4 but still the same. 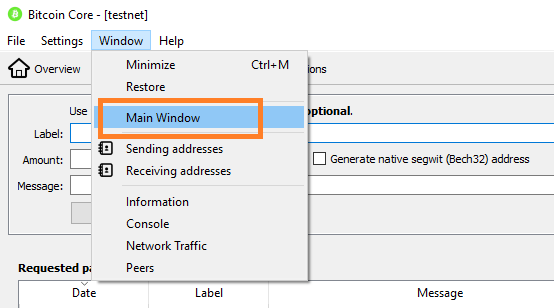 I have tried by going from one window to another and clicked on this button Main Window but it doesn't do anything so I am wondering why it's there. I compiled the software from source on WSL using bitcoin guide https://github.com/bitcoin/bitcoin/blob/master/doc/build-windows.md and running it on Windows 10. @molxyz please create a new issue for that; this issue is for finding potential release blocking problems. I think it was introduced here. @Sjors Thank you. Will do right now.